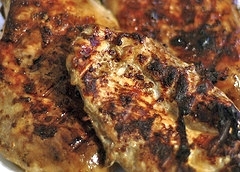 Homemade rubs: If you want a perfect piece of juicy meat, moist chicken and flavorful fish, you need to try this - today. This homemade rub is very all-purpose, great to have on hand for a spur of the moment BBQ. You can make it in advance and have it ready and waiting. While you don’t need to use a mortar and pestle for grinding these up yourself, the result is ultimate flavor when you do so. If not using a mortar and pestle make sure to grind up the spices first and then mix to combine. Place all ingredients (except salt) in mortar and pestle and crush to grind and release the flavors. Try to grind up so all spices are somewhat even in size and texture, although it is OK for the black pepper to be a little chunky. Add salt into mixture and mix to combine evenly. Reserve for later use or if you’re like me, start sprinkling on some steaks and get grilling. Combine ingredients. If you want a wet rub, add 3 tablespoons of olive oil to the mixture. Rub on meat, chicken or fish and let marinate for at least 2 hours in the refrigerator. This rub can be made ahead and stored in the refrigerator for up to 2 weeks. 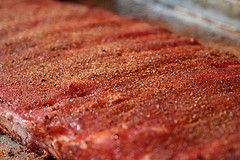 This homemade rub is perfect for ribs. Recipe courtesy of Bobby Flay. As a matter of fact, most of the rubs on this page are his, except where noted. I bring you the best because he's the best (my opinion). Mix dry ingredients together in a small bowl and rub into the chicken, making sure to get the rub into the nooks and crannies. Let rub sit on the chicken for up to 12 hours in the refrigerator. Place dark meat on the grill first because it has a longer cooking time than white meat. Grill until the internal temperature of the chicken is 180 degrees F for all parts except the breasts and is 165 degrees F for the breasts when measured with an instant-read thermometer. When chicken is almost finished grilling, baste it with a generous amount of barbecue sauce all over the meat. Save any leftover sauce for dipping. Combine all ingredients in a saucepan and slowly bring to a boil over medium-high heat; then reduce the heat and simmer until the sauce begins to thicken.